adidas Soccer has today launched the Exhibit Pack; an updated series of colorways for the brand’s most legendary silhouettes. The collection includes striking new versions of the Predator19+, COPA 19+, NEMEZIZ 18+ 360 AGILITY and X18+ silos, designed to fit the preferences of players everywhere. The Predator 19+ features a PURECUT LACELESS system to deliver maximum surface control. A FORGED KNIT integrated midfoot structure creates medial and lateral stability while a full length BOOST™ midsole provides energy return with every step. The boot also includes a Primeknit SOCKFIT COLLAR to ensure a supportive and comfortable fit and a layer of CONTROLSKIN to provide optimal grip. An ANATOMICAL UPPER mimics the shape of the heel to lock the foot into place. The Exhibit Predator19+ is also available as a cage shoe. The cage version features the same SOCKFIT COLLAR construction, PURECUT LACELESS upper and CONTROLSKIN as the on-pitch boot; along with a full length BOOST™ midsole and traction studs. The Predator shoe also comes in a lifestyle remake, taking it from the stadium to the street. The new COPA 19+ comes in a core black and solar yellow colorway. This new colorway blends tradition with modernity in the striking new design and innovative performance technology, making it adidas’ most progressive boot to date. The new COPA 19+ features a selection of elements designed to maximize fit, touch and movement. In terms of fit the internal construction, featuring foam pads and an ortholite sockliner, provides cushioning and comfort. The SOCKFIT collar is engineered to naturally expand to foot shape to ensure supportive fit while an anatomical upper mimics a barefoot experience. The new FUSE SKIN is an evolution of the COPA’s classic leather treatment that features a seamless and less permeable skin, re-defining touch for a football boot. The K Leather itself is super soft, providing optimal comfort and touch. The X RAY VAMP brings the foot closer to the ball and reduces slippage. The PURECUT laces remove unneeded layers to maximize ball control area. The design of the COPA 19+ is also engineered to maximize movement and agility. The COMFORTFRAME stabilizes movement and enhances traction. The two footshape inlays allow optimal cushioning. The stud positioning and shape have been designed to optimise rotation. Designed to enhance the performance of the game’s most agile players, the latest NEMEZIZ colorway includes an AGILITYBANDAGE with TORSIONTAPES technology, providing ultimate lockdown of the foot. A dual-lock collar secures the ankle and allows for explosive change of direction while an AGILITYKNIT 2.0 interlocking yarn structure provides a soft, direct touch and a lightweight feel. The Exhibit Pack NEMEZIZ 18+ 360 AGILITY is also available in Cage and Street versions. Featuring the same colouring as the on-pitch boot, both shoes also include the same performance technology. The Exhibit Pack also includes the latest colorway for the X18+, a boot designed to unleash the speed of the game’s most dangerous players. Released as part of the Exhibit pack - alongside Predator, NEMEZIZ and COPA 19 silos – the boot comes in an active red colorway with the three stripes highlighted in metallic silver. The SKELETAL WEAVE is compiled of an ultra-thin woven grid of optically charged speed yarns to allow for responsive touch and lightweight feel. The ultra-soft SPEEDMESH offers a controlled touch without restricting the movement of the foot. A SPEEDFRAME outsole features lightweight, Drillium engineered tooling and minimalistic construction while a 3D MOLDED HEEL provides a snug and stable fit - designed to lock the foot in place during acceleration. The Exhibit X18+ is also available as a cage and street shoe. The cage version features the same coloring and CLAW COLLAR construction and laceless upper as the on-pitch boot; along with a full-length BOOST™ midsole and traction studs. The new Exhibit Pack is available to purchase from in adidas retail stores and adidas.com beginning January 22nd. 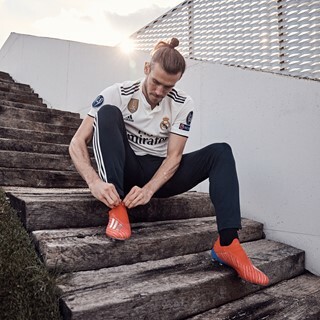 For further information please visit adidas.com/us/soccer or follow @adidasfootball on Instagram or twitter to join the conversation.